Born & raised in Flensburg, Germany, Maike came to Canada about 17 years ago to study @ UBC. She met her husband and has called Vancouver home ever since. Proud of her hometown, she pointed out that Flensburg has a connection to BC…the city build the last 3 BC ferries! Maike’s continental style knitting began in home economics class at school in Germany. Her Mother, a knitter, and her Grandmother, a crocheter, both encouraged her love of all things fibre. This year, along with some talented friends, she’s knitting for their booth at two Christmas craft fairs. 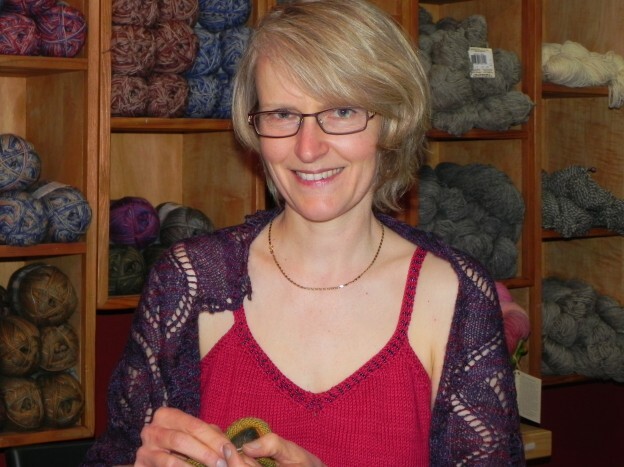 Maike, who works part time, also enjoys spinning with a drop spindle, bobbin lace making & crocheting. An avid reader, she plays piano & loves to travel. Her favourite place to date…South Africa. Her most dog-eared knitting magazines include Vogue Knitting and Verena, a German publication. The challenge of designing her own patterns makes knitting more fun for her. She currently has three projects “on the needles” using her own designs or adaptations of patterns found on Ravelry. Maike’s most memorable knitting project was the sweater she secretly knit for her husband for their first Christmas together. He was so surprised and thrilled that it brought him to tears. Where is it now, you ask? Well…he outgrew it! A multi-coloured angora sweater, started about 20 years ago before she came to Canada, was rediscovered about two years ago & entirely frogged. Some of the colours had faded and the design was very eighties. With enough white angora to start another sweater, it remains unfinished! Maike promises to bring it to “show & share” when complete. Maike loves to knit with shades on the cooler side of the colour wheel, especially blues, greys & purples. Her New Year’s resolution for 2013 is to go outside her comfort zone & work with yellows, greens & browns. Favourite yarns to knit with…merino, alpaca & silk. As a fairly new member of the WCKG, Maike especially enjoys the speakers and fibre related topics presented at the meetings. She loves the exchange of ideas and the successes and challenges that members share. Networking with other fiber crazy people and membership discounts at our LYS are wonderful bonuses! “I love all fibre related crafts because they nourish my creative and technical sides equally and I have something to show for it at the end”. “Knitting balances my life”. This entry was posted in member profile on August 29, 2013 by Marlene P..